The results are in, and Amyuni comes in on top. 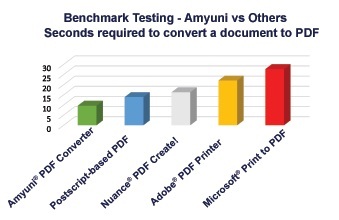 For true PDF performance, the highly accurate and reliable Amyuni PDF Converter is the most efficient in its class. Start developing with the fastest PDF conversion on the market, designed to perform in multithreaded and 64-bit Windows environments. Note: The results of this test may vary depending on different system configurations. © Amyuni Technologies Inc. All rights reserved. All trademarks are property of their respective owners.